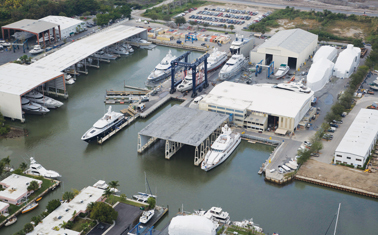 It’s A New World For Megayachts: Derecktor Shipyards And St. Lucie County Sign Historic Agreement For Development Of Repair And Refit Facility At The Port Of Ft. Pierce, Florida. FT. PIERCE, FL.- On Tuesday morning, the future for Ft. Pierce and St. Lucie County got even brighter. With a few signatures and handshakes all around, a new era at the Port of Ft. Pierce was ushered in. After a nearly year-long process, the County and Derecktor Shipyards signed a long-term agreement for the development and operation of a megayacht maintenance, repair and refit facility at the Port. Derecktor Shipyards. 72 Years. And Building. It was 1947 when Bob Derecktor began with a simple plan and a small shop in Mamaroneck NY. His goal: build boats the equal of any in the world, and do it without compromise. Today, the record says he and the yards he founded have done just that. Notable vessels ranging from America's Cup winners to massive mega yachts to rugged Coast Guard cutters have come from Derecktor. Just as remarkable is the way the business has evolved. That first shop has grown to three full-service facilities ranging the length of the East Coast. And while still among the world's best builders and still a family business, today we offer customers a variety of benefits, from complex refits to destination marinas. What has not changed is a driving determination to do it right. Which is why, when most American boat builders that were around 72 years ago are now memories, Derecktor is thriving. And still right on course. 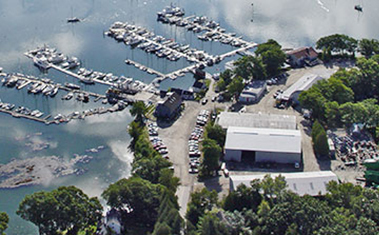 Located in beautiful, secluded Riggs Cove, Derecktor Robinhood is a full-service yacht yard and marina, offering summer slips and moorings, winter storage, yacht sales, Spartan Marine Hardware, Riggs Cove Houseboat Rentals along with the popular Osprey Restaurant. 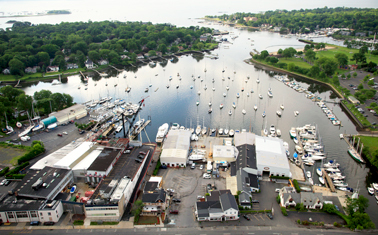 Our company Headquarters, 25 miles north of Manhattan in Mamaroneck, New York, was the original Derecktor yard, founded by Bob Derecktor in 1947. Today, the site remains our new construction base and continues to offer repair services for a wide variety of yachts and commercial craft. South Florida’s most complete large-yacht repair facility, Derecktor Florida celebrated it's 50th year in 2017. The yard caters to many of the world's most impressive power and sailing yachts, and acts as a pole of attraction for those in need of repairs, storage or major refits.